Rudyard Kipling is perhaps best well known for his tale of the Jungle Book, Kim and Gunga Din. 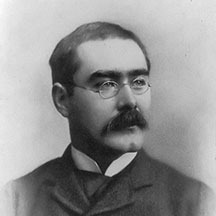 Kipling was born in Bombay in 1865. His family, as did many wealthier families, spent summers in the hill station of Shimla to avoid the heat of the plains. He later went to England and the United States. He is regarded as a major “innovator in the art of the short story” and his children’s books are considered enduring classics of children’s literature. Visit Kipling’s birthplace, Shimla, and the wildlife preserve that is said to be the home of Mowgli. Safari to see the elusive tiger. See the historical sites in Mumbai and Delhi which make India so fascinating. Kipling’s India is as entertaining as his books. Arrive in Mumbai where you will be met and driven to your hotel. After breakfast, embark on a full day tour which includes Gateway to India, Elephanta Caves, Film City, Haji Ali Mosque and Hanging Gardens. Evening is at your leisure. After breakfast you will be driven to the airport for your flight to Delhi where you will be met and driven onward to your hotel. Explore Old Delhi. Tour the Red Fort, Humayan’s Tomb, Mehrauli Qutab Minar and Jama Masjid Mosque. Visit the zoo in the afternoon. You will be driven to the airport for your flight to Shimla where you will be met and driven onward to your hotel. Today tour the hill station of Shimla. See the amazing Chadwick Fall, a waterfall amongst thick forest trees, Himalaya views from Narkanda and picnic at Prospect Hill. Visit the temple of Kamana Devi. In the afternoon shop at Shimla’s Mall. You will be driven to the airport for your flight to Delhi where you will be met and driven onward to your hotel. You will be transferred to the airport for your flight to Jabalpur where you will be met and driven onward to Kanha National Park. Today you will safari in the picturesque Kanha National Park which was the inspiration behind Rudyard Kipling’s unforgettable classic Jungle Book. Through the forests of teak and bamboo look closely for bison, gaur, sambhar, chital, barasingha, barking deer, black deer, black buck, chousingha, nilgai, mouse deer, sloth bear, jackal fox, porcupine, hyena, jungle cat, python, pea fowl, hare, monkey, mongoose, tiger, and leopard! Drive to Jabalpur and connect flight to Delhi for onward destination.